One of the more exciting parenting milestones I've reached recently is being able to go out on date nights without having to hire and pay a babysitter. My kids are 12 and 13 now, and when I was that age I was already babysitting for other families! Technology does makes it a little easier since we can easily text, call, Facetime etc. to check in regularly and head home if they need us. Not like the days when I was babysitting and you would maybe get the phone number for the restaurant where they were headed in case of absolute emergency! But not paying for a sitter makes date night more affordable and a much more regular occurrence in my life. We usually go to pretty casual places, but I still like to dress up a little without being over-the-top. This cut-out tee has been my favorite date night top lately. I first shared this tee in a top view outfit back in March with over-the-knee boots for winter, but after I took these pictures and started prepping this post I realized that this tee is only available in size Medium right now. This line tends to run on the small side so if you normally wear a Small you could likely take a Medium in this. Otherwise I linked some similar options available from other brands, like this Save Option or this Splurge Option. While I've been fortunate to work with Amazon for awhile, one thing I have not tried until now is their jeans! I mainly stick to Express jeans since I know my sizing there, but I've been wanting a lighter wash pair for Spring and Express didn't have an option that looked like what I wanted, so I decided to check out some of the options on Amazon. I have linked to some options from HALE jeans before when they were similar to a sold out pair I was wearing from Express, so that brand came to mind first. And I thought I should do a little due diligence on the line before continuing to recommend their jeans as a similar option. The brand was "inspired by" Adriano Goldschmeid of the premium line AG Jeans, but these definitely don't have a premium brand price tag. Almost all are of their jeans under $50 and the pair I'm wearing were only $25. I'm not sure about the particulars on that "inspired by" tagline but I have to imagine there is some legal/monetary relationship going on there to continue capitalizing on that name. At any rate, they had this pair of mid-rise light wash jeans that looked promising so I selected them as part of my monthly selections for their fashion influencer program. These were true to size for me, but if you look at these jeans on the model you may notice right away that that the hem is different than mine. They came with a "broken hem," but there were two problems with that for me. First, the 32" inseam was way too long for my 5'4" self. I was sweeping the floor with those hems! Second, visually it made me look like a scarecrow. Not the look I'm going for on date night or otherwise! I liked everything else about the jeans so I decided to try a DIY raw hem. I laid these out on top of another pair of jeans with a hem length I like and just cut off the bottoms with sewing scissors. In time the hem will look more "raw" but right now length is much better for me. I wanted to be able to wear them with ankle strap sandals like this without cuffing them at all so I'm happy with the result. If it's chilly at night, I grab my trusty (Minus the) Leather jacket from Express. I have had this thing for years and it's still a staple! I have to tell you though, I've noticed that some of the faux leather is flaking off a bit around the neck area. Sadly I think I'm going to need to replace it soon. I've had this for at least 7 years (since before I moved to San Diego or started a blog) so at least I've gotten my money's worth out of it. Still, this one is nicely worn in and soft so I love wearing it and kind of hate to spend money on a piece I already own! Oh well. One thing I'd love to hear from you all is what constitutes a "date night top/outfit" for you or from what you see others wearing in your neck of the woods? I love observing what other women wear on date night at different venues! There's always such a variety. My go-to date night top here might be a "Wednesday" top for someone who works in a hair salon. Or it might be too edgy for someone has a more feminine, romantic style and prefers dresses or details like ruffles instead of cut-outs. Fashion is subjective and there's no right or wrong answer, so let me know in the comments what "date night top" means to you and how it's different from your everyday top...if at all! I'm skipping my Friday Favorites segment today because it was Spring Break week here and it just didn't happen between our trip to Big Bear and then our day at Knott's Berry Farm. Spring Break week was busy but a favorite in and of itself! I'll do a little recap of our Big Bear trip on Monday then get back to the regular posting routine next week! 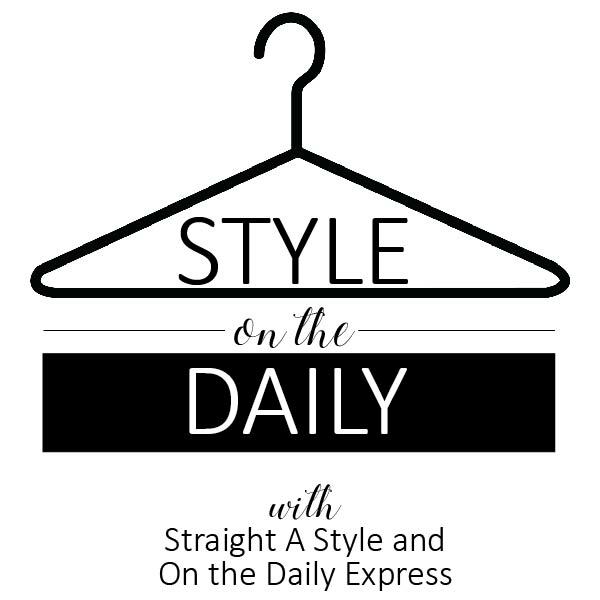 Sign up HERE for my newsletter and get a free e-book with my top three Celebrity Inspired Style Staples! It has taken me a long time to warm up to the jumpsuit and romper trend, and the number one hangup has always been the bathroom situation. I really didn't want anything that fussy or potentially awkward and I couldn't get over it. But what finally converted me to the idea of getting one is working from home and having a number of days where I don't even leave the house beyond going to the mailbox or maybe picking my kids up from school. I want to wear something other than pajamas, but it's not a good use of my time to put a lot of effort into an outfit. Jumpsuits and rompers seem perfect for this since they're one-and-done dressing. Plus, since I'm at home, I have the privacy of my own bathroom so no issues there. For a few months I had been eyeing a very similar jumpsuit from Z Supply, but that one's $84 and it just seemed like I should be able to find something similar for less. I finally had an "a ha!" moment when I started thinking of other brands that might have a similar option in a very comfortable fabric. Daily Ritual came to mind since that's my favorite Amazon brand for any casual, comfortable basic piece. I had browsed the selections on the Daily Ritual brand page plenty of times and not seen a jumpsuit, but when I specifically typed in "Daily Ritual Jumpsuit" on Amazon, there it was! And it looks almost identical to the Z Supply one but less than half the price. Amazon can be pretty funny like that with searches, though. Even when I searched "jumpsuits" on Amazon this one didn't come up! I should have known this already since it's Tip #2 in my post of Amazon Shopping Tips and Tricks! This jumpsuit is true to size (I am wearing XS here) and comes in four other colors (navy, grey, olive and black). For what it's worth, my experience with anything "Navy" from the Daily Ritual line is that it's so dark it's almost impossible to tell the difference between navy and black. It's definitely not worth owning both of those colors. I have the ankles pushed up to mid-calf here because I liked that look better, but if I extend the bottom portion it does come all the way down to my ankles. I'm 5'4" so I thought it would possibly be too long based on how it fits the model on the website since those women are usually 5'10" or so...but the length is just fine. Go figure! As you can see the top portion is a tank, and while the back isn't exactly a racerback style (it's fairly full coverage), I ended up wearing a racerback bra with it to make sure my bra straps were completely hidden. I tried it with a regular bra at first, and while they were covered in the front, they did peek out in back on the sides since the tank scoops in just a little bit at the back. It probably goes without saying but I'll say it anyway - this thing is really comfortable! It's the "supersoft terry" fabric and anything I've tried by Daily Ritual in that fabric really lives up to the super soft name! In addition to wanting it for an easy working-from-home outfit, I thought it would be great for my road trip to Big Bear last weekend, too. I don't like riding in cars for long periods of time at all, so I always want to be as comfortable as possible. And honestly it was perfect! It was so easy to just throw it on and go the morning of the drive out and it was totally comfortable for the ride. I did have to change when I got there since it was a little cooler up in the mountains, but that was fine. I was originally thinking I only need one jumpsuit, but now that I'm loving this one so much I've started convincing myself that I could use a backup for days when this is in the laundry. 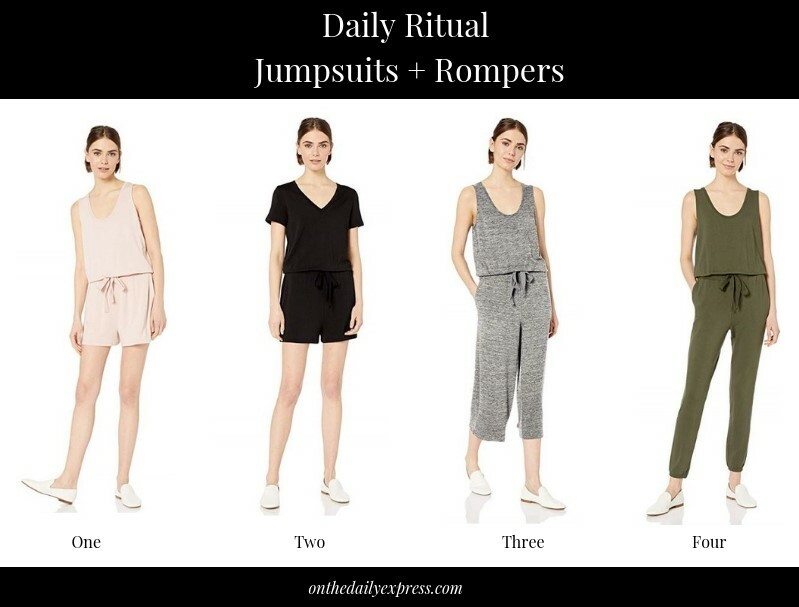 I'm also interested in trying some of the other Daily Ritual jumpsuit or romper options for different weather/activities. I'll try not to go too crazy and collect dozens of these in all of the colors, but I'm officially on board with jumpsuits at least. They are a really convenient wardrobe piece for sure. That's all for today! We just got back from our mini getaway to Big Bear so I've got to get all caught up on laundry and all that. But I do have a date night outfit post ready to go for Friday so I'll see you back here then! Thank you to Amazon for sponsoring my t-shirt and jeans in this post! 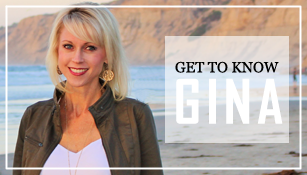 CLICK HERE to sign up for my newsletter and get a free e-book with my top three Celebrity Inspired Style Staples! 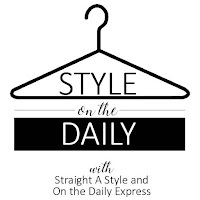 Link up your latest fashion-related posts below! If you link up, we do ask that you link back to your hosts! Thank you! I've got a decent batch of outfit selfies piling up on my phone so it's time to share a few here! As usual I'll give a few key sizing notes on current, in-stock items and link to the most similar options I can find (at reasonable prices) for anything I'm wearing that's out of stock. I love this fleece moto jacket so much that yes, I have it in both colors. Front view of the grey version is posted here and you'll see it does run a bit longer in the torso than your average moto. This is a pretty warm jacket so I layered it with a cami to balance out the warmth level since it's warming up more (most days) here. I took my youngest to a dentist appointment this day and was definitely glad I had the warmer jacket because they keep the office freezing! These LOFT Pants are true to size and perfect if you need business casual pants or just a dressier casual pant option like me! They're so comfortable! The color really varies a lot with the lighting! Based on the stock image I thought they would be of blue in them, then when got them I thought they were 100% grey. But looking at these pictures you can see more of the blue tones? I guess they're blue-ish grey. Either way...they're not black! And I knew I wanted a non-black pair of these for pairing with lighter Spring colors like pink! I thought this lilac/lavender sweater ran just a bit short in the sleeves and small in the chest in my normal size, so I went up one size. But most other reviewers thought it was true to size, and another said it ran large. How's that for helpful? Your normal size is probably the safest bet unless you want to be sure the fit is more relaxed, then order one up. You can see the front view of this sweater in this post. My sandals are true to size. My jeans, tee and sandals are all true to size here. Not much else to tell you on this one. Just my standard Spring outfit formula: Jacket, tee, jeans! 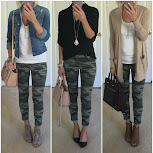 These last four outfits are leggings outfits because that's what I wear to work (from home) most days! I still have to leave the house 4/5 weeknights per week to take kids to lessons and games and what not, and sometimes I run my errands while they're at a lesson. So I need to be presentable, but by that time in the evening I'm not motivated to get on a completely different outfit just for a quick chauffeur session. I try to be realistic in sharing what I really wear even when it doesn't seem especially blog-worthy, so this is what it is most days! Everything ran true to size here. This material on this cardigan is really soft as usual with Daily Ritual pieces. Front view for the cardigan can be found in this post. My t-shirt and leggings are true to size. My camo jacket is an "old" favorite from Express, but this Target option looks nice and has all 5-star reviews for $35. Plus it's a lighter-wash camo like this, which I like for Spring. I wish I had added leopard print something to this outfit to make it a little more interesting! But oh well. It was comfortable and presentable, so live and learn. Everything was true to size here. This is another "old" favorite cardigan from Abercrombie but I've linked a couple of fairly similar options above, including a current option from Abercrombie. In my experience most of their items run true to size now, despite their past reputation for being sized for teenagers. I'm sharing this outfit last since it's most likely what I'll be wearing in real life today! We are headed up to the mountains for Spring Break for a couple of days and it's going to be a little cooler! I updated a few of my coats this year since we had a cooler-than-average winter, but most of them were nicer/dressier coats. I needed a more sporty option for this trip since we are going to be doing outdoorsy stuff in cooler weather, and I'm not doing it in my Ann Taylor shawl collar coat! This jacket was on a good deal for end of season, so while I know most people aren't really shopping for coats at this point of the year, it really is a good time to snag the best deals! I've gotten good use out of it pre-trip by wearing it to our Friday night flag football games since it's still chilly here at night (40s and 50s). This is lightweight but warm! I know some of you will say, "white will get too dirty!" so no worries...it comes in 16 colors! I just happen to like white and it makes it really easy for my kids to find me in a sea of parents post-game! Ha! Here's the latest of what's going on in the blog world, real life, and a few other notes! In Real Life: I'm on Spring Break as you're reading this in the mountains up at Big Bear! We're only staying a couple of nights, so it's just a quick getaway. When we get back, I promised to take my kids to Knott's Berry Farm during Spring Break so I have that promise to keep later this week. It's definitely not our average week around here! On the Blog: It should still be a fairly average week. I'll have a short and sweet outfit post up on Wednesday with a "new to me" style I'm trying. And Friday I'm sharing the Date Night top I'm loving lately plus some Friday Favorites as usual. I hope you'll stop by again later this week and I hope your week is off to a good start so far! I always like reading about people's favorite cosmetic products, especially if they are like me and prefer "tried and true" favorites rather than trying all the latest and greatest options. So if you're a little like me, I hope you'll enjoy today's post! 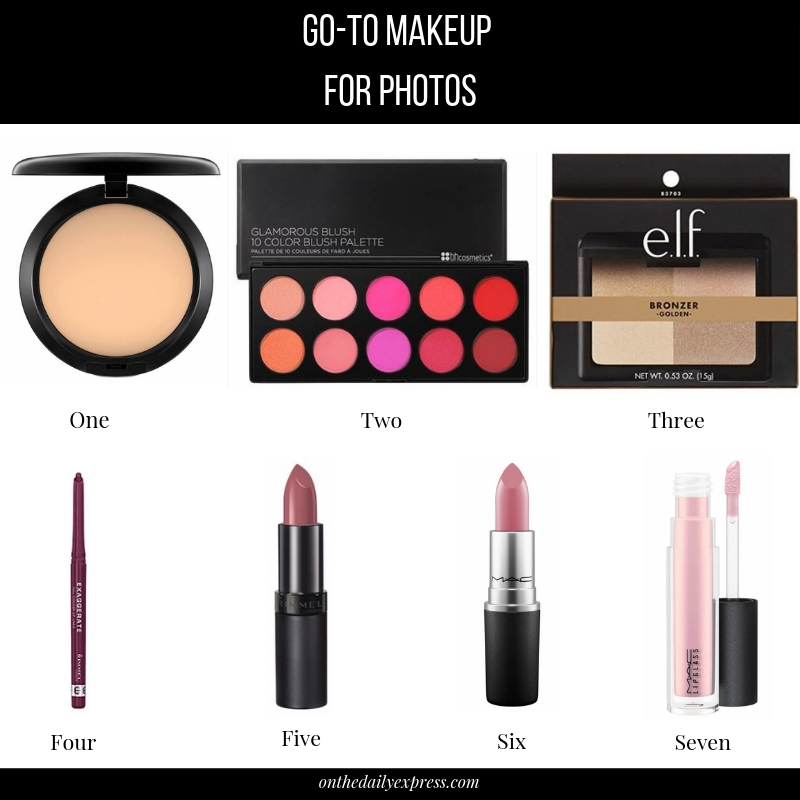 Plus, since I wear the same makeup in almost every photo you see on the blog, I thought it might be useful to have it all linked in one place since I don't really go into those details in my outfit photos. When I first started taking full outfit photos with my face, there was some trial and error in finding that certain lipstick colors or other products didn't photograph well. So nowadays if I know I'll be taking blog photos that day, I use the same products every time. In person it looks like a more "done up" face than how it ends up looking in photos, but without using some of these products I end up looking really washed out in pictures. ONE: MAC Studio Fix ($30). Whether taking pictures or not, this powder foundation has been my go-to for the last twenty years. There might be less expensive options for less but I just don't want to go through the hassle and expense of finding a new product with a good color match. One compact of this lasts me about a year, so I don't mind the cost. I wear NC15, but I'd recommend going to a MAC counter to get the right color match for you. I also just use the sponge that comes with the compact to apply! Nothing fancy but it works fine for me! TWO: BH Cosmetics Blush Palette ($10). I use either the top center color from this palette or the top row, second from the left color. The latter has a little bit of shimmer. I can't tell a big difference between the two in photos so I just use whichever one I feel like that day! I think this palette has a color that would work for just about any skintone. I've used blushes by MAC and NARS and I really can't tell the difference between those and these except for the price! I currently use MAC Brush 116 ($35) to apply. I've had that brush for ages, but I think when it comes time to replace I'll most likely get something less expensive. I've been perfectly happy with my BH Cosmetics & e.l.f. brushes for a fraction of the price. THREE: ELF Bronzer palette in Golden ($4). I can hardly tell that I'm wearing this in person, but I really do think it makes a difference in my pictures. It just warms up my face and makes it a little more healthy looking or something. I use BH Cosmetics Studio Pro Brush 3 ($5) to apply, and I just randomly swirl it around the three darkest colors and apply it just like I apply my blush. Then I use e.l.f. Flawless Concealer Brush ($3) to apply the lightest shade as a highlight on top of my cheekbones. Again these colors are very light and almost imperceptible in person, but they seem to help with photos somehow. FOUR: Rimmel Exaggerate Lip Liner in Under My Spell ($5-10). This is a plummy shade that really anchors my lip color. I line my lips with this and fill them in about 70% before applying lipstick. I will say that this is a little bit flaky on application, but once I add lipstick and gloss it blends nicely. FIVE: Rimmel Lasting Finish Lipstick by Kate 08 ($11). These next two lipsticks are the exact same color on me. So this ends up being a save vs. splurge option. I own both and keep this one in my car and MAC Syrup at home, so what I'm wearing in pictures depends on where I last applied my lipstick! I can't even tell them apart myself in photos, but if you have a brand preference these are both the same color. SIX: MAC Lipstick in Syrup ($18.50). While this is the same color as above (even though it doesn't look like it from the stock photos online), I think it's a slightly more of a moisturizing formula and goes on slightly more sheer/glossy than the Rimmel version. I don't know if I'll replace this once it runs out though...it's hard to justify the higher price when I have a nice duplicate option for less. SEVEN: MAC Lipglass in Oyster Girl ($17.50). I only use just a tiny, light layer of this to give just a little shine to my lips. In everyday wear, I do feel like this product help lock in my liner + lipstick and make it last longer. This color is very sheer and almost invisible, so I use it more for the shine and lasting power factor. Here's a Flashback Outfit from Fall with the same makeup but slightly different lighting. For my everyday makeup when I'm not doing photos, I use all of the same products, I just apply them with a bit of a lighter hand. I also usually opt for a lighter, more neutral lip color for everyday wear. My photo-friendly lip color looks a little more bold in person than it does here, but my everyday lipstick doesn't show up at all in photos so now I just stick to my plummy color combo for pictures.I also still like using LipSense on days when I want a really long wearing lip color, but I'm also not crazy about how any of those colors photograph on me. They end up looking too brown or too bright pink in pictures, even when I don't think they look that way in person. That does it for the makeup portion of my favorites, but I do have a few other things to share here today! 1. My favorite Spring/Summer pajamas are back in stock at Target! In the past couple of weeks I've started mixing these in with my favorite long sleeve/long pants pajamas from Amazon. The Amazon pair does have shorts/short sleeve option as well, but the Target version is still cheaper so I'd get that while you can! The fabric on these two feels exactly the same to me, so I often sleep with them mixed and matched, e.g. Amazon long sleeve top with the Target shorts. For size reference, I have a Small in the Target Pajamas and XS in the Amazon pajamas. I don't necessarily think either one runs small or big (maybe the Amazon pair runs a tiny bit big) as much as it came down to my personal fit preference on the shorts...I especially wanted those to be relaxed. 2. Flashback Friday: My favorite Daily Ritual Striped T-Shirt Hoodie is back in stock so I wanted to share another outfit for Flashback Friday! Every time I've posted this hoodie it's been sold out in most sizes in the striped version. This was my very first piece from this line and I still love it! It's just so soft and comfortable! I ordered a Small in this to have extra length for wearing it with leggings. You can see the front view of this tucked/untucked and styled a few more ways in this post. 3. Favorite Book this Week: I finished Before She Knew Him by Peter Swanson earlier this week and loved it! It was a great page turner with cat-and-mouse suspense! I'll do a full review in my May Book Reviews, but that's almost a month away since I just did April Reviews on Tuesday. I didn't want to wait that long to share this one! 4. Spring Break Getaway! Later this weekend I'm heading to Big Bear with my family and I can't wait! We decided not to do a big trip this year but we did want a little getaway. It really helps us spend more quality time together when we're not at home with all of our distractions. Big Bear is a small mountain town a few hours away from San Diego. We've never been but have heard good things, and we have a cute Airbnb cabin in the woods reserved so we're hoping for a fun little adventure. I'm not active on social media so there won't be anything to follow along, but if it ends up being worth it, I'll share a blog recap for other locals or those who just enjoy travel content in general. I'll be prepping some content in advance so I will still have new posts up on Monday and Wednesday. On Monday I'll be sharing some top view outfits lately, so I'd love for you stop by and say hi! Two things for today! First, an outfit, and second the Shopbop Sale! This is the big one friends! No minimum purchase - 20% off any order under $500. If you're really splurging, 25% off any order over $500 using promo code EVENT19 at Shopbop. There are some exclusions, and I know some of you wanted Millers sandals in the last sale but they were excluded (ahem hey Lisa!). So if you are wondering about those...YES, Tory Burch Miller Sandals are included in the sale! It's great time to get a pair for Spring or Summer! I'll share what I'm getting from the sale plus some Save. vs. Splurge outfits below, but first, an outfit with some Spring color! I spent the winter wearing all of my favorite neutrals, but Spring has me adding a little color back into my wardrobe. When I got this cream utility jacket this winter I was thinking it would be fun to pair it with a bright colored top for Spring looks...but then I had no such bright colors in my wardrobe! So I ordered this Caslon t-shirt from Nordstrom thinking it would be a good color on me. Plus it's been a blogger favorite for years so I was curious about it in general. My verdict? I like it! I'm especially happy with the color and otherwise satisfied the fit and feel of the tee. I find the sizing of the t-shirt true to size, and it fits almost exactly like the Whisper Cotton Tee by Madewell that's another favorite of mine. (You can see how I've worn that one in my Favorite White V-Neck tees post.) It has the same small pocket on the bust as the Madewell tee (hidden by my jacket, of course). I would say this one is a bit longer in the torso, so it might be a better option for tall ladies. It looks like sizes are starting to sell out in this color, so if you don't see your size you can check out this option at Express in a very similar color with more sizes (for now!). This Military Cargo jacket is a repeat piece last seen in this post. It is true to size, but it comes in numeric sizing. I'm wearing a 2 and I would say it runs similar to a 2 in Express jackets, but it's a bit larger than an XS in Express or Old Navy jackets. I hope that helps some with size selection, but at least it has Prime Shipping/Free Returns if you need to order a couple of sizes to get the right fit. These sandals are true to size and while they are pretty comfortable for their height, I honestly wish they had a strap that went around the back of the ankle. I'm always afraid they aren't going to stay on! I don't wear them if I have a lot of walking to do, e.g. anything more than a trip to Target would constitute "a lot!" If I could find a similar style that was a bit more secure I'd be all over it, but since I already have these I'll just keep using them when I can since I do still like the look. That covers the details for today's outfit, so let's move on and talk about The Shopbop Sale! This sale is the best time to save on popular brands (or some of my favorites!) that don't go on sale as often like Madewell, Tory Burch and Rebecca Minkoff. 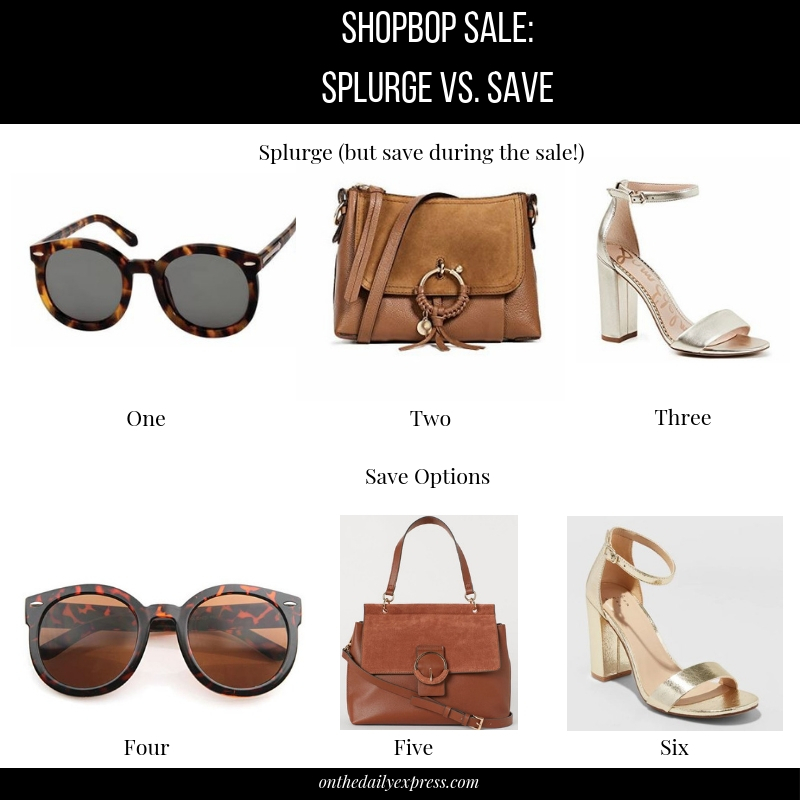 If those items are still too much of a splurge during the sale, no worries, I've got a few Save options for you today! In general my favorite categories to shop for during this sale are handbags and shoes. For me, those are the pieces that tend to last longer in my closet and get the most use to make it worth spending a bit more. I know I'm not alone in that! Since I'm more likely to repeat the same pair of shoes or bag day after day than I am to repeat wearing the same top a few days in a row, it easily brings down the cost per wear. Right now I'm shopping the backpack selections and sunglasses for my upcoming Spring Break activities. I was originally planning on Quay Sunglasses but now I'm leaning toward Le Specs since this shape looks closer to my favorite prescription sunglasses that I always wear in photos. Both lines are more reasonably priced (under $100) than Karen Walker or higher end options like Gucci, etc. I've also been eyeing those Sam Edelman cap toe pumps for awhile! I like the lower heel height and this is the perfect season to wear them. My blogger friends Rachelle and Noelle have the Chanel version and love those, but I think the Sam Edelman version will suit me just fine. Rachelle said they "make any outfit classier" (I'm sold!) and they "go well with black and tan and white"...which is 80% of my wardrobe so I'm jumping on these first thing for the sale! Can't wait to see what everyone else is eyeing and buying in this sale! See you back on Friday! *This post was created in partnership with Shopbop. Thank you for supporting me in working with a small number of brands that I genuinely love! Welcome to my April 2019 Book Reviews! I have a mix of fiction and nonfiction, although this month I didn't read as much nonfiction as usual. I'll share more about that at the end of the post, but as usual I did a mix of Kindle reading and Audible reading, so I'll share which format I selected since the audio can really make or break a book! 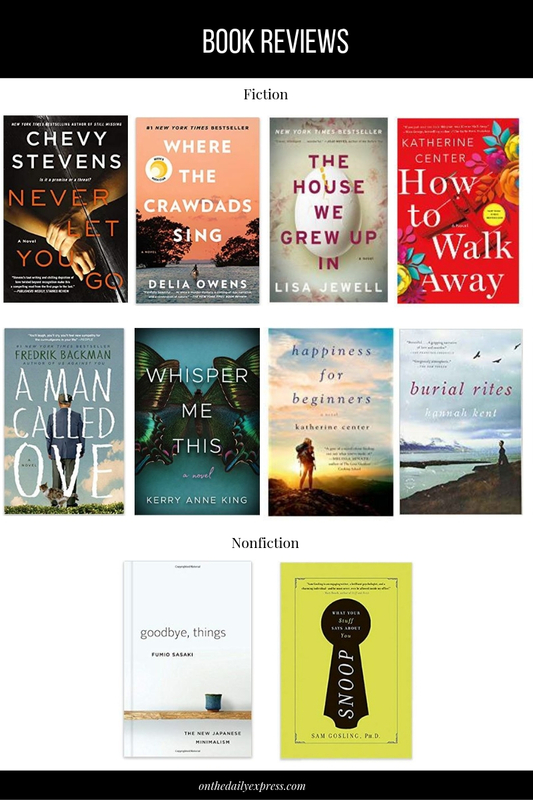 Here are the books I read this month followed by my reviews. Basic Plot: Lindsey has a controlling husband who just can't let her go. My Verdict: Enjoyable Enough. Note to self: don't select a book if a key plot point involves a controlling, manipulative, and/or abusive husband/boyfriend. Reading this book made me realize I'm completely over this story line. That said, based on the great reviews of this book and my past enjoyment of the author's work, I kept with it despite being annoyed early on. Somewhere around 40%, the plot moved away from the aforementioned theme. By 50% I was fully engaged and the last half was enjoyable and easy to zip through. There's a twist that I didn't see coming, and my heart was racing towards the end! While it won't be a favorite, I don't regret reading it. Basic Plot: A young girl comes of age on her own in the marshlands of North Carolina. Meanwhile (in an alternating timeline story pattern), someone else is found dead in a neighboring town and the deceased may have a connection to the outcast girl. My Verdict. Very Good. This book was slow getting started, but I've come to expect that from books with carefully developed characters and story lines, so I was okay with that. And it was interesting enough that I wasn't bored even through the slow start. But somewhere before the halfway point I was 100% engaged in the main character and invested in the murder mystery, so the majority of the book was very enjoyable and interesting. The writing was excellent and the research that must have gone into this (on a number of levels from scientific to legal to historical) was impressive. All that said, since this book was very hyped I'll say I didn't enthusiastically love it as much as a lot of people. But don't get me wrong since overall I did think it was a great book. I think it's just hard for anything to live up to that much hype! I'll be shocked if it doesn't become a movie! I listened to this on Audible and the narrator did a fantastic job. Basic Plot: Complex family drama where everyone has their secrets and a tragedy effects everyone in different ways for years to come. My Verdict: Compelling (but slow). Lisa Jewell makes her characters very real and complex, but that takes a lot of time and careful development. I really enjoy this type of book on audiobook since it makes for great company throughout the day. But...I'd be hesitant to recommend that someone read this in written form unless you know for sure you like this type of family saga/chic lit in written form. Also, a lot of this plot revolves around Easter so if the book does appeal to you in general, this would be a good time of year to read it! Basic Plot: Margaret's life is all going perfectly until her best day becomes her worst day. My Verdict: Recommend! I really don't want to say too much about the plot because I think it's more enjoyable to go in not knowing certain key plot points. So don't browse too many reviews because even though some things that happen in the first two chapters...it's just better not to know! Anyway, I went into this thinking it would be "chick lit" and it has all that and more. It goes deeper than a Sophie Kinsella novel and I really enjoyed that. This is an easy one to recommend! This was my first book by this author and I plan to read more ASAP. Basic Plot: Ove is a grumpy old man who is constantly put out by neighbors. My Verdict: Slow but Endearing. It seems like most people love this book or hate it. I think I am somewhere in the middle. I didn't love it...it's just not my thing. And it started off so slow. But about a third of the way through, the character development started to draw me in and I was able to enjoy the rest, but I wouldn't say it was a favorite. A few things I have to mention. First: Ove was only 59?! I believe they only mentioned his age once later in the book and I just thought the way the character was written he needed to be at least 69! Second: this is a movie?? When I grabbed the link for the book, a Prime Video movie option also came up. I guess it is subtitled but it has great reviews. Has anyone seen it? I listened to this on Audible and the narrator did a pretty good job...however he narrated another nonfiction book I've read twice (Influence) and it threw me off a bit trying to hear him as a fiction reader. I guess I associate his voice with "education" rather than "entertainment." Basic Plot: Maisey goes back to her hometown when her mom dies and starts uncovering family secrets. My Verdict: Do Not Recommend. It was a serious struggle to get through this one. The book couldn't decide what it wanted to be. It started off with murder mystery then added in romance, domestic violence, and family secrets/drama. But for me it just didn't do any of those things very well. And the text spent too much time on details that didn't matter to the plot. I finished just to see how it would be resolved and to learn all the family secrets, but didn't enjoy the process and have no clue how it gets such great reviews on Amazon. This was my least favorite book of the month. Basic Plot: A family in Iceland in the 1800s is forced to house a convicted murderess while she awaits her execution. My Verdict: Recommend! This was very engaging and haunting! I listened to this on Audible and the narrator was outstanding. She had this ghost-like voice that just draws you into the story. I recommend doing the audio version if you have that option, although the book overall gets great reviews so apparently people enjoy the written version just as much. Great characters, elements of suspense and overall strong story development and sense of really being there in a different time and place with the characters. I'd love to read another book by this author. Basic Plot: Helen signs up for a challenging wilderness adventure tour to re-calibrate her life post-divorce. My Verdict: Very Enjoyable. Since I enjoyed How to Walk Away by this author I wanted to check out more of her work. This was an easy, enjoyable read though I did like "How to" better. This came first so maybe the author has grown in her talent which is admirable. Either way, it was an easy enjoyable read. I did feel like some of the wilderness adventure was really glossed over, but it kept the pace moving along so it didn't bother me much. Overall I appreciate this author's voice. I think she does "chic lit with some deeper perspective" very well and I'll continue to read more of her books. This is almost like a memoir of a Japanese man who decided to become a minimalist. He shares his own experience of what he learned by becoming a minimalist and all of his reasons for becoming a minimalist in the first place. The "reasons" discussion relies heavily on things he learned from Marie Kondo and social psychologists such as Sonya Lyubomirsky. This was a fairly short audiobook (4.5 hours) and it was enjoyable enough. It didn't convert me to minimalism, but I like reading this type of book every now and then just to help inspire me to de-clutter or just remind myself that life is about more than the pursuit of things. The topic is exactly what the title implies: what you can learn about someone by "snooping" their belongings. Snooping even sounds a bit more sinister than the reality of this book, which is just what you can learn by carefully observing someone's surroundings, whether it's their office cubicle or the photos on their walls at home. As I'm writing this review, I just finished this book earlier in the day and I feel like this is one of those times where some distance after finishing a book is a better indicator of its impact than my instant feelings post-reading. Sometimes I find myself applying things I learned from a book in my everyday life for months/years to come, but I don't know that right away. What I'm getting at here is that I didn't really love this. First, the narrator was not engaging. He did a decent job but was robotic at times. Second, there were lots of lists in this book, and many times you were meant to compare the two long lists for differences, which just doesn't work that well for me in an audio format. It also seemed to go way more into detail on the Five Factor Personality Model than I expected from the topic. While I am interested in that, it was presented in a dry manner and again, it was hard to follow on audio. So my current verdict on this is, "neutral but it may prove to be more useful over time." Thoughts on Nonfiction Lately: When I first started using Audible, I wanted it primarily for nonfiction books. Now that I've been using it for about a year and half, I feel "caught up" on all the nofiction I initially wanted to read! It's getting more difficult to find nonfiction books that engage me and have an impact on me. Over time I've also gotten more picky about narrators. If numerous reviews mention terrible narration I just don't buy the book because I know it will bother me too. And I'm also picky about the research being current/recent if it's a scientific/social psychology book since that's what makes it feel relevant to my life. So if you happen to notice a reduction in nonfiction selections this month and going forward, that's the reason why! I'm always up for a good recommendation so let me know if you have any! Nonfiction: None this month were outstanding to me. While I did like Crawdads, I didn't put it on my "Recommend" list because I feel like it's been recommended enough! I do think it's a book that will stand the test of time and it's worth reading, but I will let the people who loved it more than I did be the ones to recommend it and sing its praises. I'm currently reading Before She Knew Him by Peter Swanson. He's one of my favorite authors and I'm having no trouble getting into it at all so far! I'm listening to The Murderer's Son on Audible, but it's too soon to have an opinion. I do love my British Crime Drama TV Shows so this seemed like a good option for an audio version. Can't wait to hear what you all read or what strikes your interest this month! There are some things I really don't understand about myself, like why it seems I suddenly love a certain color or color combination that I didn't care about before. Sometimes it's just opportunity, like my lilac color crush this Spring. I've always liked the color but it hasn't been around as much in the past few years and now it's everywhere, so I'm all over it. But black and camel is classic and yet I've only started gravitating toward this color combination in the past year or so. Not to worry, I'm making up for lost time on this combo! Ha! I have an outfit from our rainy Winter that never made it to the blog along with a more recent Spring version I wore with this color combination, so I'm sharing it all today in a color-themed post. First up is one of my favorite "juxtaposition" pairings that I love: no sleeves with long pants. Outfits that shouldn't make sense (if you need pants don't you need sleeves?) but sometimes with mild temps it works! This is kind of the opposite version of the long sleeves plus shorts outfit I shared last week, and I'm jumping at every chance to wear this type of look while the weather allows it, but I did have a cardigan on hand for the evening cool down. I kept it simple and went for black-on-black NYC vibes with a black cardigan. I have not shopped at H&M in ages but when I saw this sleeveless turtleneck sweater I thought it would be a great neutral basic. I was going to wait for a free shipping promo, but then I realized their shipping is only four bucks! It was still only going to cost me $20 total for this, and I wouldn't have batted an eye about spending $20 on an item like this with free shipping at Amazon. And for what it's worth, Amazon does have a very similar version for $19 with Prime Shipping. Sizes are selling out in my H&M version so the Amazon option might be good for a similar look if you don't see your size at H&M. My version is true to size and very soft. It's not itchy at all around the neck. In fact I didn't even notice I was wearing a turtleneck at all, but then again I have gotten more used to wearing this style of top this year so it may be different for others. Back in the rainy season I took pics of another black and camel outfit combination I wore with a couple of different options for wearing it depending on the weather. For some reason or another I kept putting off posting these, and while they are a bit more winter-y, several pieces are still good for cooler spring days. Last winter (2018, that is, not 2019) I collected a lot of trendier, budget-friendly sweaters and at the end of the season I didn't love the vast majority of them nor the state of my closet. This year I wanted to be mindful of quality over quantity so I overhauled my sweaters and selected more classic styles. This Lark & Ro black cashmere sweater is very reasonably priced for cashmere, true to size, and very soft! It's thin which makes it nice for layering with a coat but still keeps you pretty warm on its own. If you don't want to splurge on cashmere, Lark & Ro also makes a similar style for $29 that's non-cashmere. Both options come in several different colors. Speaking of layering, I felt a little high maintenance on this particular day because I brought my scarf and my coat with me the whole day so I could maintain the black/camel combo regardless of whether I needed my coat. I just didn't wear them both at the same time! I knew I wanted a necklace if I wasn't wearing my scarf, so I tucked my necklace into my sweater when I was wearing just the scarf with no coat. That kept it handy as an accessory, but out of the way. I have seen people wear both a scarf and necklace together and make it look nice, but it was just too much in the way for me with this outfit. I've share this coat a few times (first seen here) and it's really more of a jacket since it's not warm enough for true winter weather. It's true to size and still in stock on Amazon. At the time I'm writing this, sizes Small, Medium and Large are only $60! It retails for $145 at Revolve so that's a great deal on this classic piece. If you wear XS unfortunately you'll still have to pay $145. I hate when they have different prices on different sizes! I'm not sure the reason for it but it doesn't seem fair. On the Blog: Coming up on the blog this week I have Book Reviews tomorrow! Then on Wednesday I have an outfit with a repeat favorite, plus a wishlist and save vs. splurge options. Friday I'm sharing some beauty favorites, so all in all it's a busy week on the blog and I hope you'll stop by! In Real Life: I survived my dance workshop last weekend! Actually it was really fun and makes me want to go back again ASAP. The teacher kept the choreography at a fairly beginner level which was great for someone out of practice like me. It was a Bob Fosse-inspired workshop so focusing on the body alignment and positions was enough of a challenge! It was new and different for me and I loved the challenge. It's the last week before Spring Break here and it's packed with a bunch of extra appointments and activities. Of course! It's the storm before the calm, so I'll just buckle up and get in survival mode here. Knowing that I have time off on the horizon should help me get through it! See you back tomorrow for Book Reviews!